Things have been a bit dead here at Technasma with real life getting in the way… However now things are not just dead, they are Undead and back from the grave with a vengeance! We’ve got some all sorts of grizzly and ghoulish miniatures to share, all inspired by Warhammer’s Arch Illuminator, the inimitable John Blanche. Readers may remember the Blanchitsu style Bloodletter we showcased a few months ago. He was so much fun to paint I decided to create an army painted in this style. In truth it grew from a number of kits I’d bought for a Vampire Mordheim warband and snowballed from there. 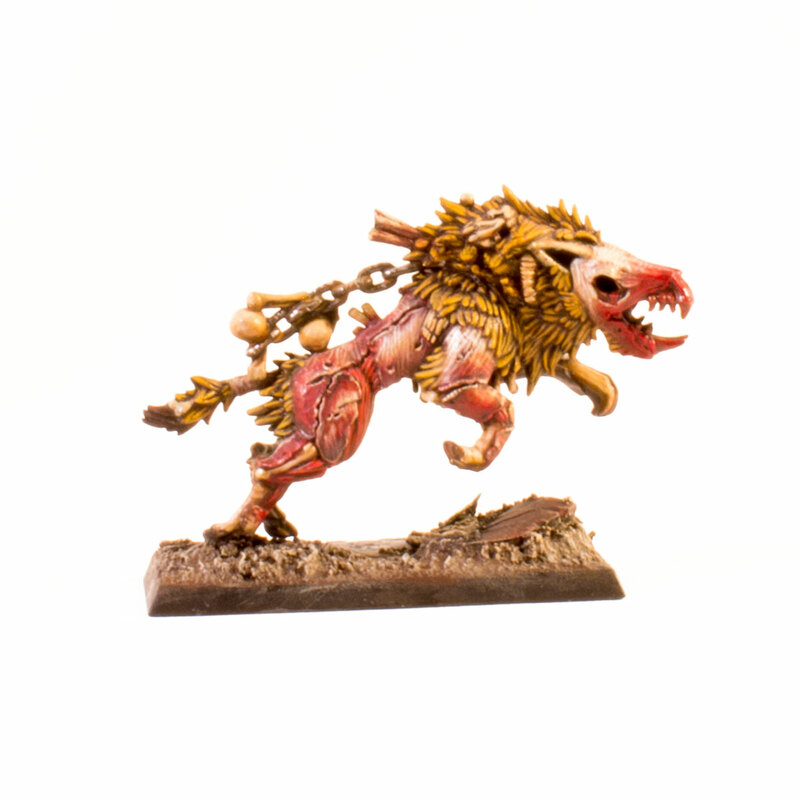 The Dire Wolves were the first unit I completed. 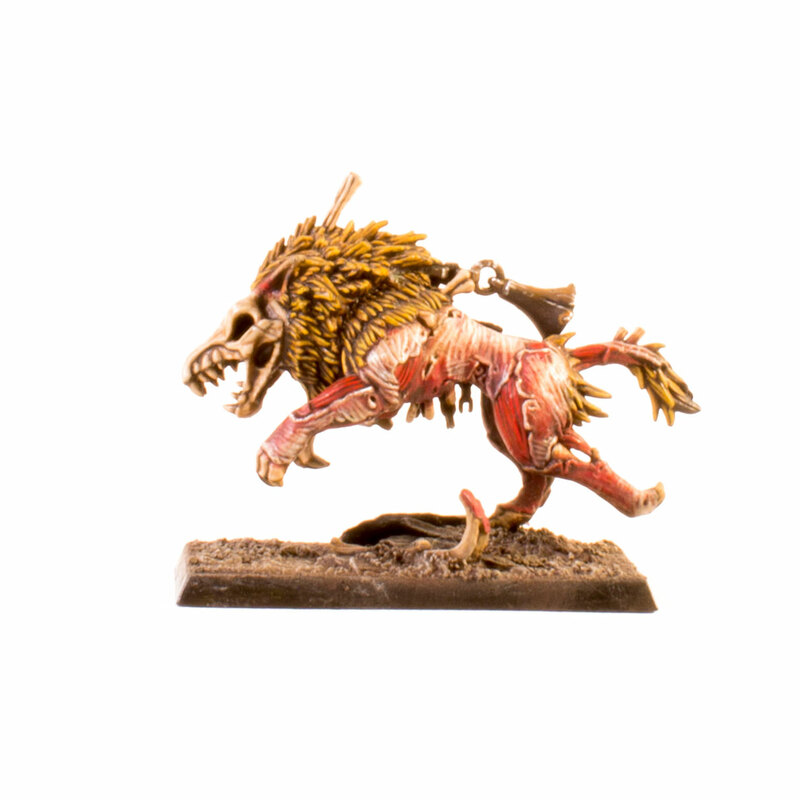 Dire Wolf by John Blanche from White Dwarf 338 March 2008 © Games Workshop – used without permission. The concept art back from when the Vampire Counts range was re-released in 2008 was utterly inspiring. (Aside: Its a shame that Games Workshop have stopped showing us behind the scenes of the design process – they hide such talent and inspiration.) 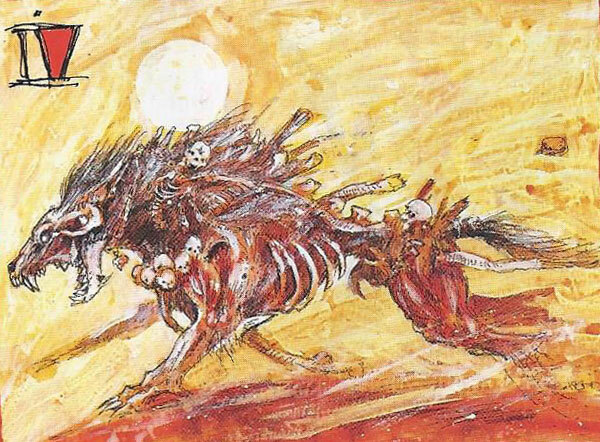 The Undead of Warhammer took on their own identity – Dire Wolves, no longer your average barghest or hell hound, became necromantic constructs; prehistoric beasts summoned from mass graves – grizly amalgams of jaws and matted hide. I converted my Dire Wolves to bring them even closer to the original concept art. 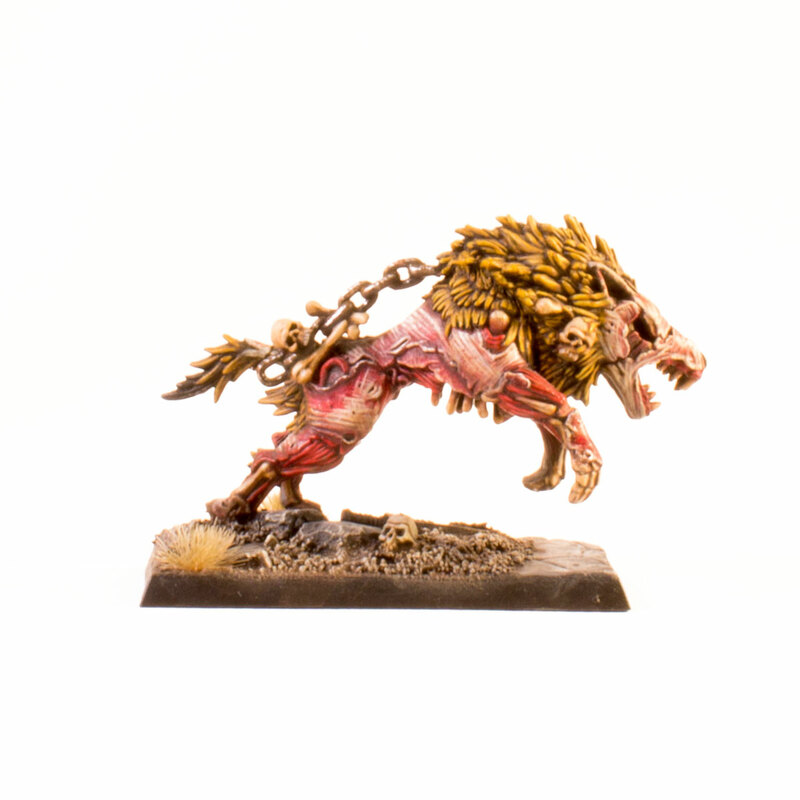 I added chains to the stomach of one, purity seals and more skulls to other models, even tiny coins and talismans nailed into their hides. I strove to emulate John Blanche’s use of sepias and reds. The very limited palette was a challenge and turned into a bit of a labour of love, but I love the rich autumnal colours. As I explained in a previous post about my Cairn Wraith, I start by underpainting the model and laying down some of the key colour values. Here I drybrushed Mechrite Red and Vallejo Charred Brown. I then started with the flesh, painting successive glazes of Bleached Bone – Over 20 different layers to build up colour. With bright, white-based paints I find you need to use very thin coats or the paint will dry chalky and leave ‘coffee stain’ marks. After all they do say patience is for the dead! Next I applied washes and glazes of reds, starting off with Vallejo Dark Red and Scab Red to emulate rot and contusions. 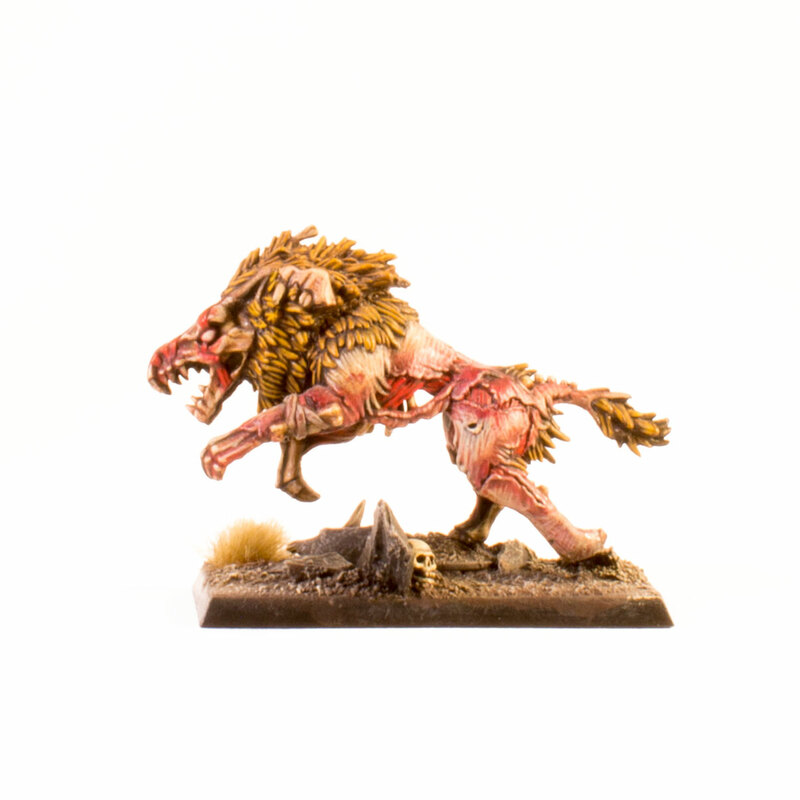 I used thinned down Bleach bone lines on the skin to make it look flayed but also to emulate John Blanche’s painting style. The flat areas of the model are a canvas to apply textures to. Very thin glazes of Bubonic Brown, Agrathax Earthshade and Vermin Brown were applied sporadically across the model to tint the underlying colours. The line work, red and brown glazes were applied ad nauseam until I was happy with the result and then final highlights of Bleach Bone and white were applied. This might seem laborious but to be honest the process was really relaxing and enjoyable! 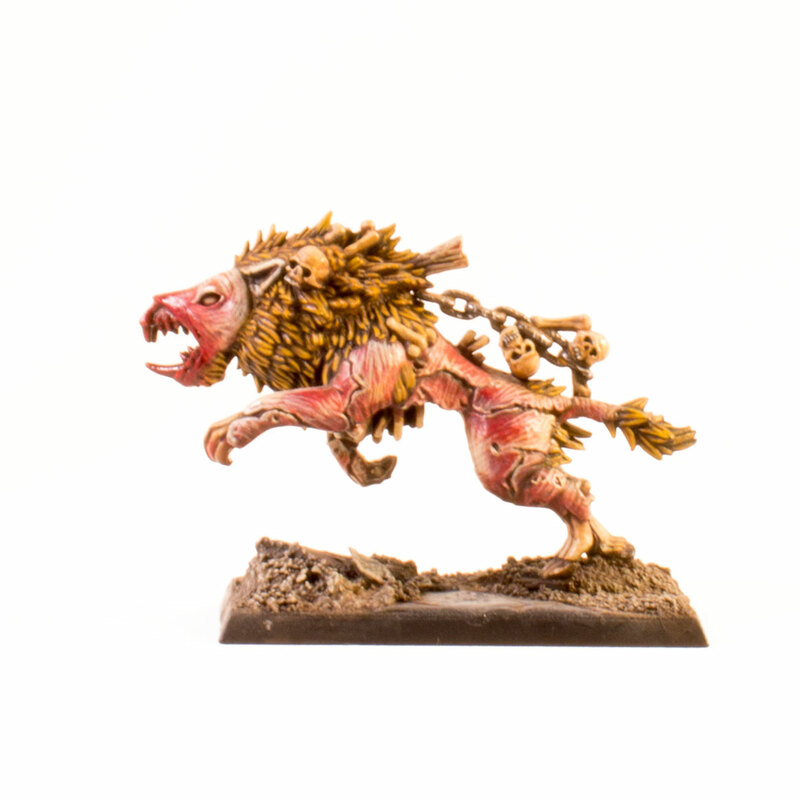 I opted for mangy, sepia coloured manes, building up from Scorched Brown to Bestial Brown and Vermin Brown, with a wash of Agrax Earthshade in between. For the teeth, bone and claws I started with layers of Scorched Brown and Bestial Brown. After a wash of Nuln Oil I used Bubonic Brown and Bleached bone to add some mid tones and highlights and finished with a glazes of red to tint. Near the end of the process I applied applied a glaze of Graveyard Earth across the whole miniature to pull colours together and add that freshly disinterred feeling! I hope you liked my Dire Wolves. I wanted to share a bit of my process in this blog post as we do get quite a few questions about our painting techniques, so let us know if you thought it was useful or not in the Comments. This entry was posted in Armies on Parade, Showcase, Tim Price and tagged #ageofsigmar, #warmongers, Blanchitsu, Death, Dire Wolves, John Blanche, Technasma, Tim Price, Undead, Vampire Counts, Warhammer. Bookmark the permalink. Those are just awesome. They look fantastic, and I feel you really nailed the style. Thanks Thor! They were a learning curve, but one of those projects where the painting process was as enjoyable and valuable as the sense of completion at the end!